So, it looks like the Halloween bug bit me a little early this year. It’s not even October yet, and I have Halloween on my mind! It probably has to do with the fact that I’m trying to encourage my 6 year-old daughter to make a costume choice early this year because I want her to make her costume rather than buy one. She’s super creative and crafty that I think she’d have so much fun making her own. Right now she’s choosing between being a gem miner and a witch. Personally I’m pushing for the gem miner, but I have a feeling she’s going to go for the witch. When friends came over for dinner this week, and I was thinking about what to make, witches and Halloween were ruminating in my head. 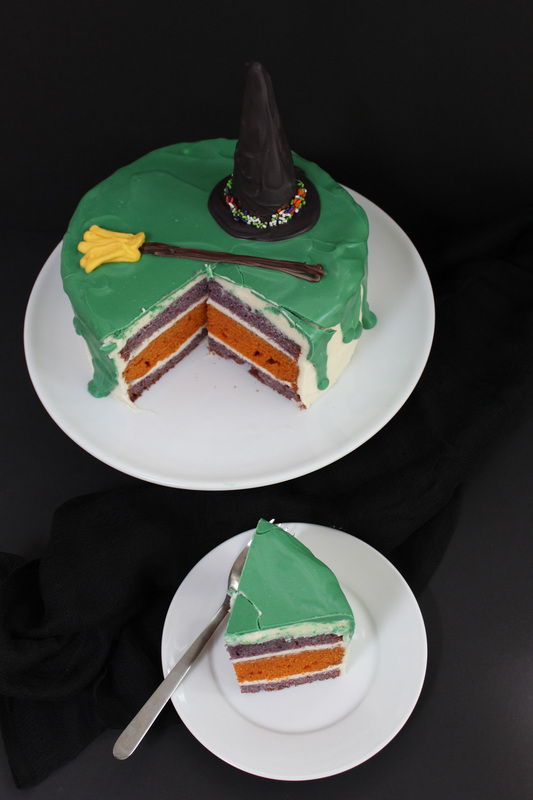 So I thought I’d make a Halloween inspired cake. At first I wanted to make this awesome bat cake from Cookies and Cups. So cute! But apparently the red candy melts and blood-red cake were a little too spooky for my girls. When they saw the photo, they both said there’s no way they’d help make, eat, or even look at the cake. (Pretty dramatic reaction to a cake, wouldn’t you say?). We have never been (and will probably never be) a spooky Halloween kind of a family. The cute, whimsical Halloween is much better suited for our family. 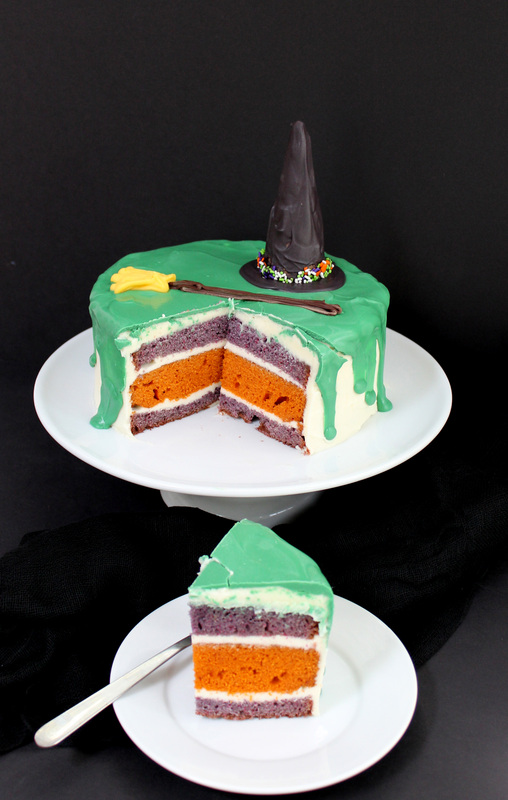 So we came up with this melted witch cake. The witch’s black hat and broom were all that was left after she melted! I couldn’t just decorate the outside of the cake. I wanted something festive on the inside as well. 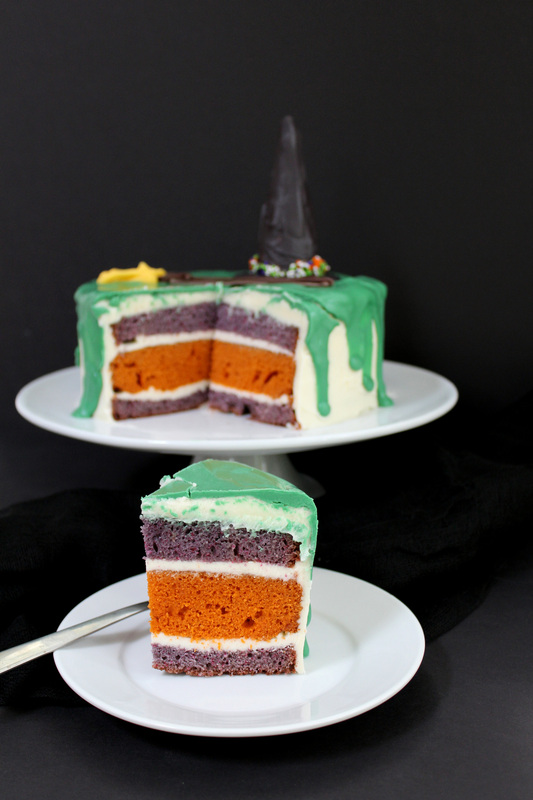 So we went with a purple and orange cake layers. Since I used a red velvet recipe for the cake (just substituting orange and purple for the red food color), the cake does have a bit of cocoa powder in it. Thus the purple and orange layers aren’t quite as bright. If you want a vibrant orange and purple, you can use a white cake recipe like this one. Of course you could also use a white box cake as well. All the decorations for the cake were super simple. My 6 year-old pretty much did them herself. For the witches hat, we simply dipped a sugar ice cream cone in black candy melts. The brim of the hat is just some black candy melts piped into a circle. And for the broom, we used chocolate chips and yellow candy melts. I drew the templates for all of the shapes on a piece of parchment paper, flipped the parchment paper over (so the pencil marks were facing down), and taped the template to a cookie sheet. After melting the candy melts, putting them in zip-top bags, and snipping the corner off of each bag, my daughter filled each template with the candy melts. We stuck the whole sheet in the fridge, and once all the decorations were cool, it was done! After the cake was finished, my girls loved how it looked on the outside and inside! We all agreed that this is the spookiest we could get for Halloween. What about your family? Do you do a spooky or a cute Halloween in your home? The red velvet recipe is adapted from Terri Wahl's jumbo cupcakes. For the cake: Line the bottom of two, 8-inch baking pans with parchment paper and grease them. Preheat the oven to 350 degrees F.
In a medium bowl, sift the flour, baking soda, salt, and cocoa powder and set aside. In the bow of a mixer fitted with a paddle attachment, add the oil. With the mixer on low, slowly add the sugar about ¼ cup at a time. Mix in all the sugar until completely combined. With the mixer on medium, add the butter milk, eggs, vinegar, vanilla and water. Mix well. Turn the mixer to low and slowly add the dry ingredients. Mix until just combined. Divide the batter equally between two bowls. In one bowl, place the orange food color and mix well. In the other bowl, add the purple food color and mix well. Bake for 40 to 45 minutes or until a toothpick inserted in the center of the cake comes out clean. Once the cakes are baked, allow them to cool in the pan on a wire rack for about 20 minutes. Then release them from their pans. Allow the cakes to cool completely. For the decorations: Melt the black candy melts in a deep cup. Dip the pointed end of a sugar cone into the candy melts. Using a spoon, spoon the black candy melts over the top of the cone. While the cone is still wet, pour sprinkles over the edge of the cone. Place the cone onto a plate covered with parchment paper. Place it into the fridge to cool completely. 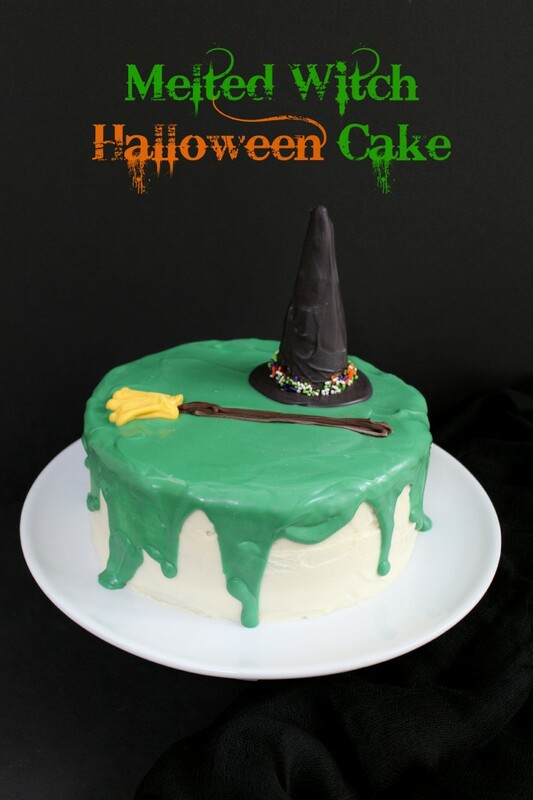 Take a piece of parchment paper and using a pencil, draw a broom stick and a circle (which will become the brim of the witches hat). Turn the piece of parchment paper over so that the pencil marks are facing down. Tape the parchment paper to the underside of a sheet pan. Melt each of the candy melts and chocolate chips. Place each color in a zip-top bag and snip the corner of each bag. Pipe the decorations using the template. While the black circle is still wet, place the hardened black sugar cone into the middle of the black circle, creating a witches hat. Place the pan into the fridge to harden. While the cake and decorations cool, prepare the frosting. Beat the butter and sugar until light and fluffy. Add the vanilla, salt, and milk/cream. Beat until just mixed. To assemble the cake: Slice the purple layer into two, thin layers. Stack the cake and fill it with frosting. Apply a thin coat of frosting to the top and sides of the cake. This layer of frosting is called a crumb coat. It helps keep the crumbs from mixing into the final coat of frosting. Chill the cake until the frosting is hard. Apply the final layer of frosting to the cake. Set the cake aside. Take the decorations out of the fridge, and set them next to the cake. Melt the green candy melts. Pour the green candy melts over the cake, allowing the green candy melts to drip over the edge of the cake. 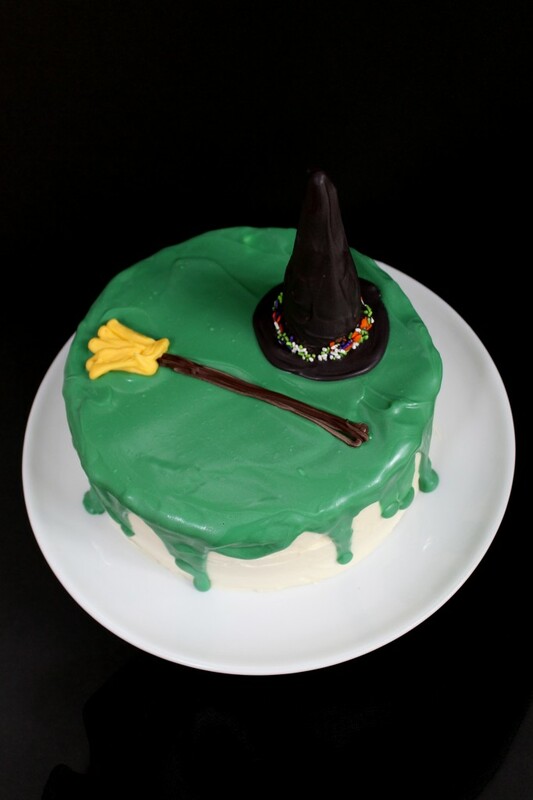 While the candy melts are still wet, place the witches hat and broom on the cake. What a cute idea! So clever… My boys get freaked out by the scary Halloween stuff too but I think they’d love this! Love your fabulous recipe. Stopping by from the Party in your pjs. I would be honored if you would consider sharing your delicious post on Foodie Fridays where I am co-hosting. The party starts Thursday 9 pm Est. Hope to see you there. Thanks so much for the kind words Shari! I’ll definitely check out Foodie Fridays! Thanks so much for stopping by The Crafting Foodie! What a great cake, it looks amazing, thanks for linking up at the Project Parade Linky Party #12. How fun! This cake is really cute and festival all at the same time. My kids would be a little scared of the other cake too. Can’t wait to see what you come up with next! This is so clever and cute! Love it! I, too, am more into whimsical and fun. Thanks so much Sue! I can’t wait to see what you have in store for the holidays! I love the humor of this cake. Pinned. Awesome. Thanks for bringing it by Weekend Bites. How much fun is this!! It would be the perfect treat to eat while watching Wizard of Oz as well, lol. Thanks for sharing on Weekend Bites, you’ve been featured this week!